Tabbed docks in ObjectDock enable users to simplify access to their applications by organizing cluttered desktop resources into logical groups. Desktop applications and files can be organized by projects, tasks, or any other characteristic that makes them intuitively easier to find. Create and lock down standard Docks with icons and shortcuts that your team will need to accomplish tasks. 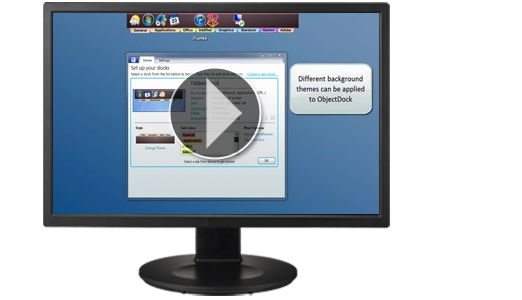 ObjectDock enables administrators to create new and modified docks, then push the updates to networked users. Administrators can populate and lock down user docks, preventing end-user system modifications and unauthorized access to resources. ObjectDock has over 10 million downloads. It is the most popular Windows® dock in the world. Copyright © 2019 Stardock Corporation. All rights reserved.